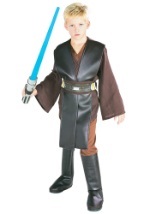 Let your newborn, infant or toddler become this infamous Sith ruler in our infant Darth Vader costume! The suit is made out of a soft poly/flannel material and snaps up in the back and along the inseam of the legs. Also includes a detachable cape and headpiece. Make the most of your kids first Halloween costume with this infant Darth Vader costume!